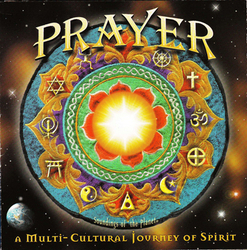 Prayer CD was created to offer the richness of the planet's diverse spiritual traditions! This awareness of embracing the universal truths reminds us of the cultural and spiritual heritage we share as one human family. A long list of amazing voices comprise Prayer CD. Some included are: Krsna Prema Das, Nada Shakti, Mai Uttal, Rebbe Soul, Lorelli/Singh Kaur, Savae Vocal Ensemble, and His Holiness the Dalai Lama. May these multicultural prayers invite you to energetically connect with the divine source of all traditions as you listen to this Prayer CD! Click "view larger" for back cover with songs.